Written on 20 December 2013 . 04.30pm pm on December 21. December 21 was considered another golden day for Vietnamese martial artists who outperformed their opponents winning 7 gold medals. Vovinam artist Ho Minh Tam won Vietnam’s 72nd gold after defeating a Lao opponent 3-2 in the men’s 65kg weight category. This was Vovinam Vietnam’s sixth gold at this SEA Games. Earlier, Vovinam artist Nguyen Thi Kim Hoang took gold in a final match against a Lao opponent in the women’s U55kg weight category. In Muay: Bui Yen Ly knocked out a host athlete in the women’s 51kg division, bringing the first Muay gold medal for Vietnam. Nguyen Ngo Trieu Nhat and Bui Thi Quynh carried off two other silver medals after losing to Malaysian and Myanmar artists in the 51kg and 48kg weight divisions. In Taekwondo, Nguyen Trong Cuong also knocked out Sophal Mao of Cambodia in the final match of the men’s 87kg weight division. 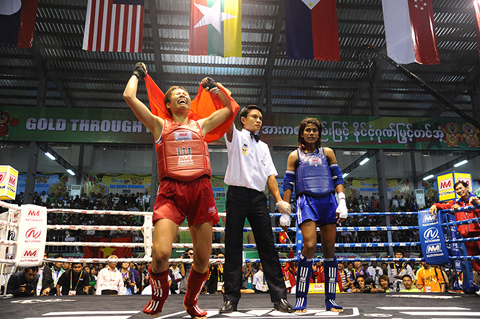 His team mate Ha Thi Nguyen was overwhelmed by Seavmey Sorn of Cambodia in the women’s 73kg qualifiers. In Kempo, Do Hong Ngoc outplayed Dian Pertiwi Said of Indonesia in the women’s 48kg category, earning Vietnam the first gold medal in this sport. Duo Tran Thi My Duyen and Le Duong Lan Phuong also clinched another gold medal for Vietnam in the performance event.